THE BIGGEST LOSER returns to NBC tonight with a new episode and it is makeover night. On tonight’s show the last five players compete in the show’s first ever sprint triathlon to win a guaranteed spot as a finalist – and a brand new car. Did you watch the last episode before the hiatus? We did and we have a full and detailed recap, right here for you. On last episode it was one of the most eagerly-anticipated episodes of “The Biggest Loser” season — the makeover episode! The fun began with fashion expert Tim Gunn, who worked his magic helping the contestants select stylish new outfits to flatter their new slimmer selves. Then celebrity hairstylist Ken Paves, whose clients have included Jennifer Lopez, Victoria Beckham, Lady Ga Ga and Eva Longoria, crafted incredible new looks for each of the remaining seven contestants, leading to amazing and dramatic transformations. Then they were whisked away to enjoy a special night out and heartwarming, emotional reunions with loved ones flown in to celebrate their big day. Later, it was back to reality and the ranch, where two players fall under the red line at the weigh-in and were eliminated, revealing the final five contestants of the season. On tonight’s show the stakes are higher than ever when the five final players compete in a “Biggest Loser” first — a sprint triathlon, requiring them to swim ½ a mile, bike 12 miles and run three miles. The triathlon winner will secure a coveted spot as a finalist, as well as a brand new Ford Fusion. Then it’s an emotional trip down memory lane as the contestants watch footage of their journeys with their trainers, and see firsthand how far they’ve come since arriving on the ranch. Later, it’s time for the last weigh-in before the finale, where two players will fall below the red line and go home, and two more will become finalists, joining the triathlon winner to compete for $250,000 and the title of “The Biggest Loser” at the season 15 finale. The Biggest Loser season 15 episode 14 airs at 8PM on NBC and we will be live blogging it with all the up-to-the-minute details. So make sure to come back to this spot and spend the evening with us! Make sure to refresh often to get the most current details and updates! 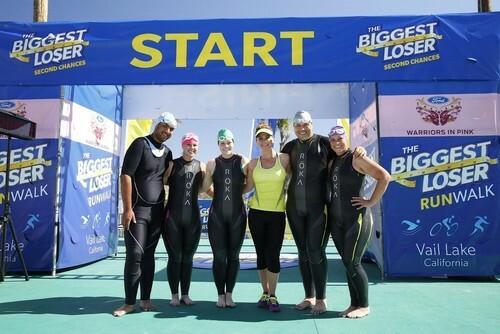 Tonight on the Biggest Loser, the contestants are preparing to take on the Biggest Loser Triathlon, and also for the final weigh in before the finale. The show begins with the contestants sharing their thoughts on their journey so far. We get to see each member in a short video montage as they began at week one to the point they are at now. It’s truly amazing to see their transformations. Bob asks Chelsea if she remembers what he told her in the beginning-that she was a “firecracker”-and that’s why he wanted her on his team. Bobby shares with Jillian how much pressure he is under to win because he doesn’t want to disappoint his family. Jillian tells him that he has to change his way of thinking because if he has fear, he will fail. She encourages him by telling him that his parents are already proud of him, and the only thing he has to fear is regret. He’s lost over 100 pounds, and Jillian tells him that he has left a significant impression on Bob and herself. Tammy shares how much she enjoys going to the gym now, which is a drastic change from the person she was in the beginning. She shares that she has now started her very own restaurant, Living Soul, and she’s testing out her restaurant’s menu on her family and friends today. Tammy says her menu can be described as healthy comfort food. Alison welcomes the contestants to the first ever Biggest Loser triathlon. The contestants have to swim a half mile, bike twelve miles, then run three miles. One of the prizes is Ford Hybrid. Jackie and Dan, contestants from previous seasons, and spokespersons for the Biggest Loser Run/Walk are there to cheer on the contestants. Jackie and Dan encourage the contestants before the games begin. The contestants begin the swimming competition. David believes Rachel is strongest in the water, and focuses on beating her in the race. Rachel begins in first place, Bobby is in fifth. Jennifer gains a lead to first half way through the swim but Rachel’s not far behind. Bobby is still struggling and begins to panic. He’s not discouraged though, and he re-focuses on finishing the race. Rachel is first out of the water, with David not far behind. Chelsea comes in third, with Jennifer and Bobby in fourth and fifth places, respectively. Meanwhile, David and Chelsea work to catch up with Rachel, who’s now ahead in the bike race. She keeps up first place throughout the bicycle race, and begins first in the run. David comes in second, but is worried because Rachel is nowhere in sight. Chelsea, Jennifer, and David hold their respective places as well. Chelsea finishes the bike portion just as Rachel runs through the finish line as the winner of the triathlon, making her an automatic finalist for the Biggest Loser finale. She finished the run in under 30 minutes and the swim and bicycle race in just under an hour. Naturally, Rachel is emotional about her win. Meanwhile, David finishes the race holding second place. He finishes in one hour and 57 minutes. Chelsea soon follows in third, with Jennifer finishing the race in fourth. Bobby is in fifth place, but he is proud to have completed his first triathlon. He says the finish line is really the “starting gate” for him and the rest of his life. David expresses his pride in Rachel for winning the triathlon. After the triathlon, the coaches meet with their finalist to review their journey. We see an in depth montage of each contestant throughout their weight loss journey. The contestants view their old selves sharing what they hope to achieve on the Biggest Loser. Each contestant gets emotional as their former selves remind them why they began the competition. The contestants are all in tears and filled with emotion by the end of each montage. The coaches share how honored they are to have been apart of each contestant’s journey. It’s time for the final weigh in and, as David points out, the stakes are high. Two of the five remaining contestants will go home. Two more will join Rachel in the finals, competing for the title and $250,000 dollars. Rachel is first to the weigh-in-her current weight is 150, 112 pounds down. Chelsea start at 241, and she weighs in tonight at 157 pounds, she’s down seven pounds from the previous week. Jennifer weighed 266 going in to the competition, she weighs in now at 182, down three pounds. Bobby’s next. He came in weighing 358, he’s got to lose ten pounds to stay in the competition. He weighs in at…commercial break. Bobby lost SEVENTEEN pounds with a total weight loss percentage at 6.85 percent! He’s in the finals! David is last to weigh in. He began the competition weighing more than 400 lbs. His current weight is 243, down sixteen pounds, making him the third finalist in the competition. The remaining competitors each declare that they will be the next Biggest Loser.